Rabbit in a Day contest! 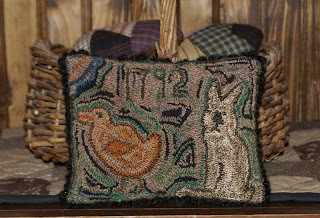 New Easter Punch Needle Pillow! Lazy day and warped dies! New Hexagons and Last night of Contest! It was snowing today, so decided not to go out. Then I got bored and wanted to make something for fun. So, I made a rabbit to go with my eggs. I started out with a pattern that I found on the web. If anyone knows who made this pattern, please let me now so I can add a link. I found it while wondering around and just found the pattern pieces and there is no name on the print outs. I don't have the originals, so would love to know who the pattern belongs to. Post note: I found the designer! 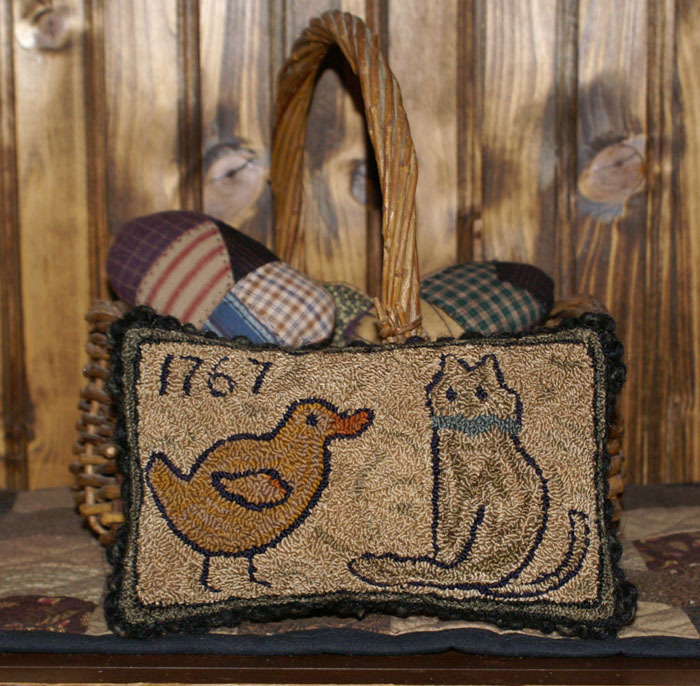 The designer of this pattern is Denise Bailey of KKL Primitives and she has the pattern is on her site. Her bunny is called Hippity Hop. I used the original face but I lightly stuffed the arms and legs. The orginal had tied fabrics. The original had a skirt and straps, I made a longer skirt and added a shirt. I was thinking of adding an apron with a pocket for carrots, but maybe I will leave her as is? I just wanted something simple and fast. I gave her the egg to hold, but I think I might make some fabric flowers or a mini easter quilt for her to hold. I hope you like her, she was fun and fast. How about a contest? Give her a name and I will draw from the comments. 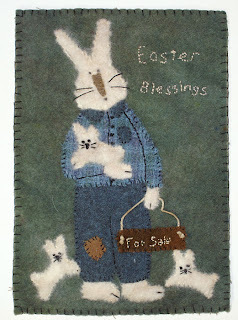 One winner will receive my new easter pattern, that i need to make this week. I will draw a winner, next Sunday from all of the entries. I decided to remake the rabbit into a kitty, for all of the kitty lovers. I gave this one a different background and still keep the antique look. I will be offering the pattern for the two designs, next week. I think this would be really fun to hook up, too. 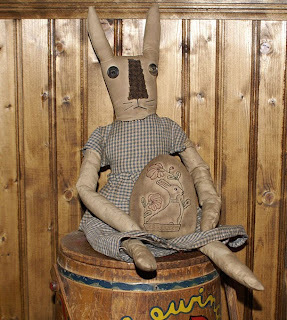 It looks great with a basket of primitive eggs. I decided to make a pattern for the reproduction rug that I made. I made it for a group project and thought my viewers and pattern buyers might like to make this piece too and at a reduced price. I am offering it for only 3.00. 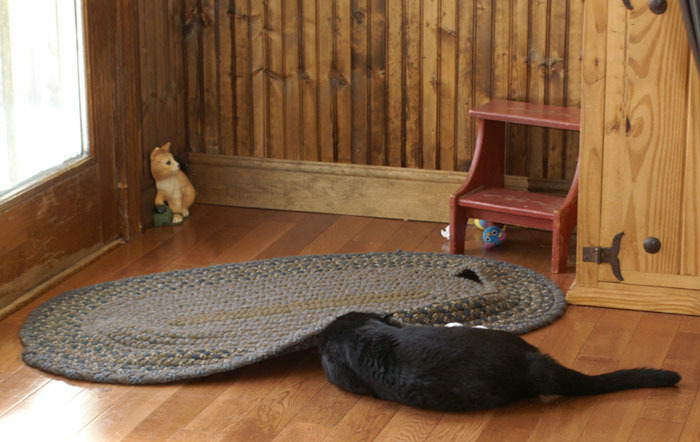 You will get a jpeg file with a photo of the rug and the pattern itself. You can use it as is, or reduce it for punch, or enlarge for a rug, it is up to you. There are no instructions or color charts with this item. A great design and project if you are looking for something new to do this weekend. You can find the pattern at my eCRATER site or at the link on the left. Let me know what you think of patterns like this, simple but for less. Or do you prefer the full pdf files? With patterns that I do in punch, I have to do larger files to include color charts and instructions, but if you like the idea of patterns for less, let me know and i can do more in the future. This is the rug that I made, before I trimmed and and cleaned it up. 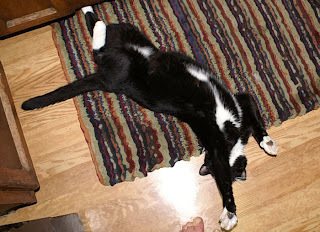 I have it on my floor, but it gets heavy traffic, so needs a good clean and some rehooking from kitty claws. First of all, I thought I would mention my last posting. No, I did not take Moki to the beach, lol. 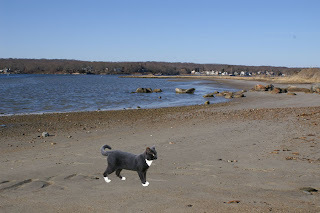 That is Photoshop Magic;) Thought, I wouldn't doubt it, if he would love to go exploring with me, he is a character. I decided to try some eggs with one of my patterns and this one is with the epattern; Spring Flock. I might do the lambs next on some eggs. The first one I did with markers. I like the idea of coloring them in, but I don't have much control with shading and art markers. The second is done with stitches. I think I like the stitches by themselves, more prim too. 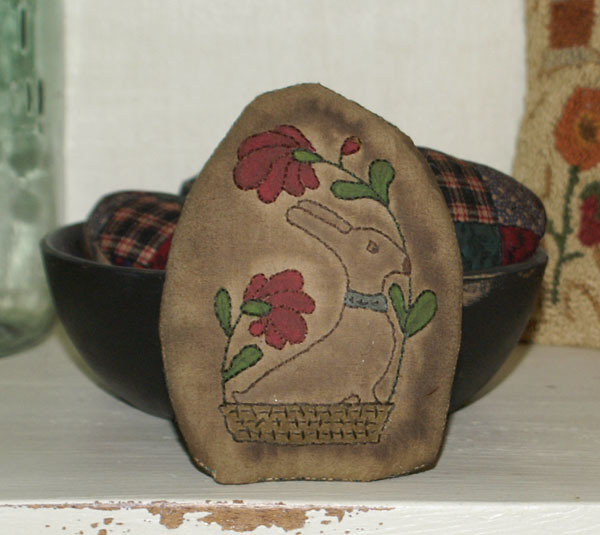 I am thinking this rabbit would make a nice small wall hanging, as well. 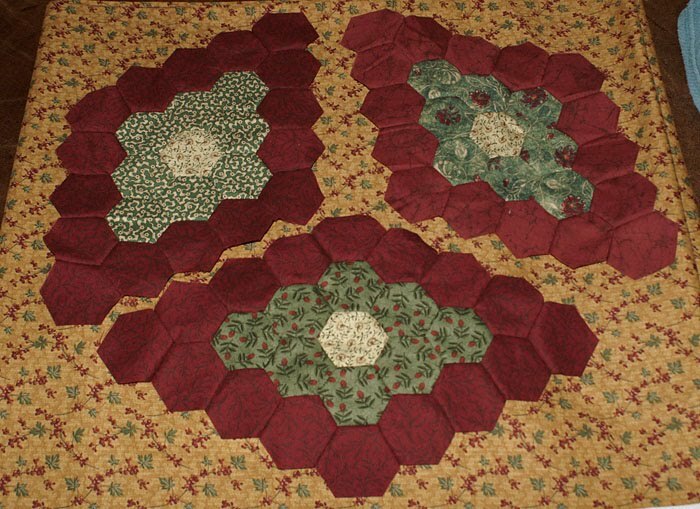 You can find this and other patterns at my ecrater site. We went for a sunday drive today, it was cold, but the sun was shining, so nice day to get out. We like to take the scenic routes, so we checked out the rivers, hit a few shops and then went to check out the breachway. 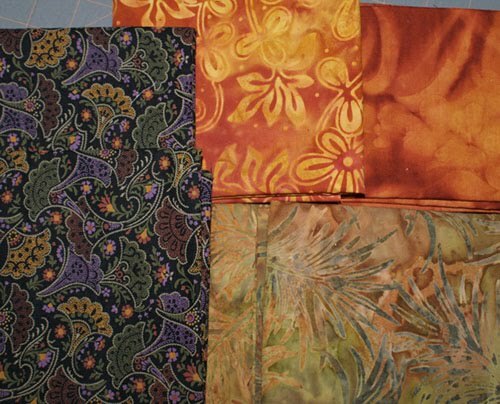 And to show you that I don't always buy prim fabrics and have been building a secret stash of batiks, to play with. I want to do some art pieces, so when I hit a quilt store, I like to get fat quarters that have nice patterns. I also found the black paisley and think it will make a beautiful border for a fratur style quilt. 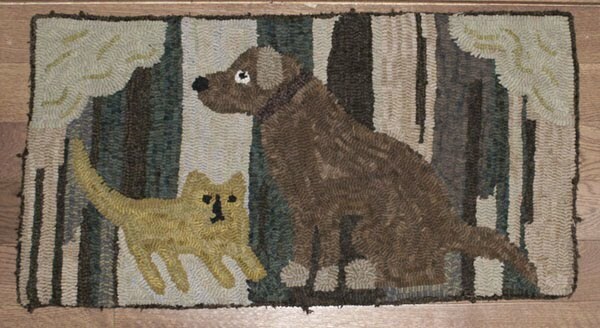 Sometimes I see something that inspires me and an old rug is what motivated me to make this new piece. The original was a cat, but I thought, that would work as a bunny, so a little bit of recreating and a new piece was born. I used variegated linen on the rabbit and the rest of the colors are an over dyed variegated floss. I started with the green and realized I didn't have enough, so I added another shade to fill in the rest. In the old days, woman used scraps of old clothing, so many rugs are multi-colored or done in blocks of color. I hope you enjoy my newest piece, it will be for sale, tomorrow night, on ebay. I hope I can get a good outdoor photo tomorrow, the flash really makes the color more vivid than they are. I am on an egg craze, lol. It is fun experimenting and trying different types and inspiration for all of you, to try your own. 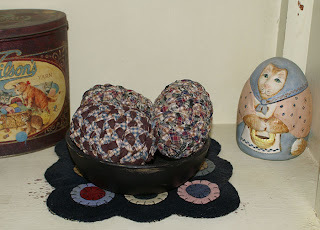 I went fabric shopping and found some cheater fabric, so of course I had to get some, to try some quilted eggs. 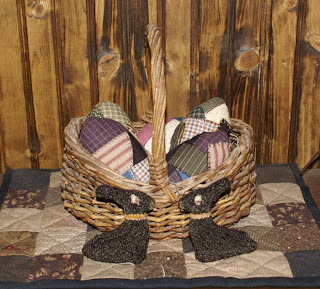 I cut out the egg shapes and using a piece of batting behind them, quilted them with black pearl cotton. Then I sewed them together and stained them. Great way to make quick eggs to fill a basket. I need to watch how I sew my tops to keep them more rounded and next time I will try two pieces of batting to get it to look more quilted. And this egg took me a while. I used fabric and artist markers to color in the design first. Then I outlined it with black and did a little fun stitching. I can get a little shading and blending with the markers, but I might try painting the next ones with acrylic. If you would like to make your own egg, you can find the design at Mary Corbet's. I did not use anything to trace the design on this one. I taped the design on my light box, then I taped the fabric over that. Then I colored in the design, so I could just outline it with the black, afterwards. I did antique it with walnut ink, but the flash washes away the antique look. I am skipping Valentines and going straight for Easter, lol. I was looking for egg ideas and saw a photo of some braided eggs. Of course I didn't bother to look at the instructions, I just jumped in, as usual. I saw that they used plastic bottles, I decided plastic eggs were easier. So, you can visit the link above or try and follow my abbreviated version. You do need to know how to braid with fabric and here you can find the instructions. For my braids, I did not use any sewing, I just made braids with the strips, for larger braids, I hand turn. The braids were about 30" long for the 3 " egg. I also kept braiding after I got my 30" to make another 30" for the next one, much easier than starting over. This is just a basic idea of how I did it, if you want to try it, you do need to know how to braid and get the hang of it as you go along. For my eggs, I bought 3" plastic eggs and sanded the surface. You want your surface to be rough so that the braids don't slide and the glue adheres. I made my braids, similar to the tutorial, mine are a bit more raggy. To put them on the egg, I used ailenes tacky glue and lots of it, so it is messy. I started at the top and put the raw edge at the tip of the edge, then folded the braid over that, to hide the edge. Then I added glue to the next level and pressed my braid down, keeping it tight against the first row and continued down and around. When I get to the bottom, I start to flatten the braid down until I get to the bottom center. Cut off excess braid and glue it to center, making sure no egg is showing. You can add glue to the fabric to get the cut edge all pressed in and work it to keep it flat. It starts out wet with all the glue, but it is nice because you can hand press to reshape areas that seem off. Here is a close look. The first one came out better, the other two I rushed and made smaller braids, so they were stiffer and more ragged. That is one thing I noticed, larger, softer braids are easier to get around the egg. I went out shopping today and treated myself. To me a treat is walking around the store and loving a million things but making excuses why I shouldn't buy it, lol. But I did find a material to go with my hexagons and on sale, love those sales. I wanted to go with a dark tan, but this color works with the fabrics I am using and will give a little more color for the holidays. What do you think? I can't wait to start adding this to the outer edge, but need to rest my poor fingers. Then I found some nice basic tan floral, always need lights to mix in with the darks and on sale, who can say no to a few yards. 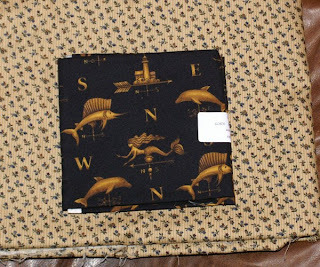 I found the black fabric and thought it would be perfect for a border on a mermaid piece for my bathroom. So now I need to come up with a new idea and make one. 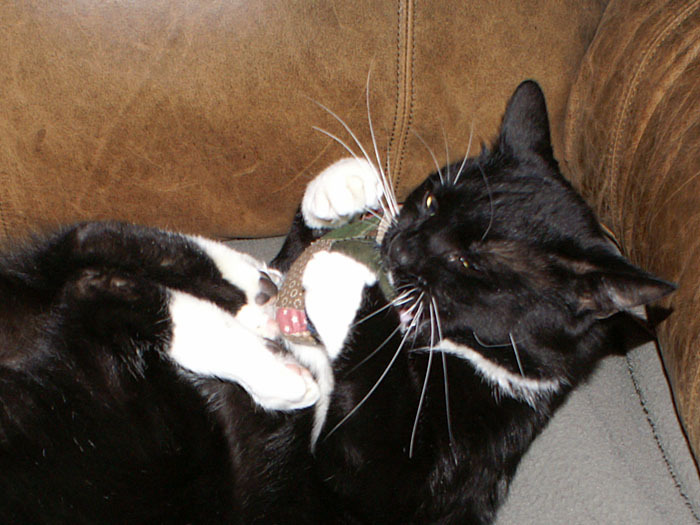 And last but not least, there is Moki, gotta love him. I think my rug needs a repair, I made it about 30 years ago, does that make it an antique, lol. He seems to like the hole, great place to stick his head into. And to answer a few questions. The mini quilt on the bench is one I made up with scraps. 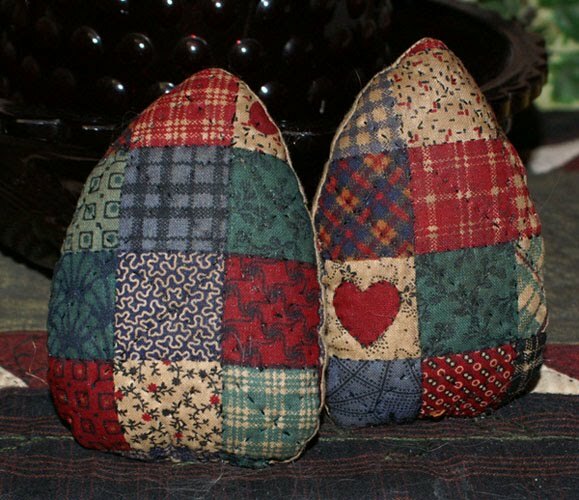 Just sew some squares together, hand stitch with black floss, add a border and an easy table or bench topper;) And for the scrap eggs becoming hearts, I made some last year with crazy quilting. Another easy and fun way to use up scraps. You can see them Here! I decided to finally take the rest of my Christmas items down and redecorate. 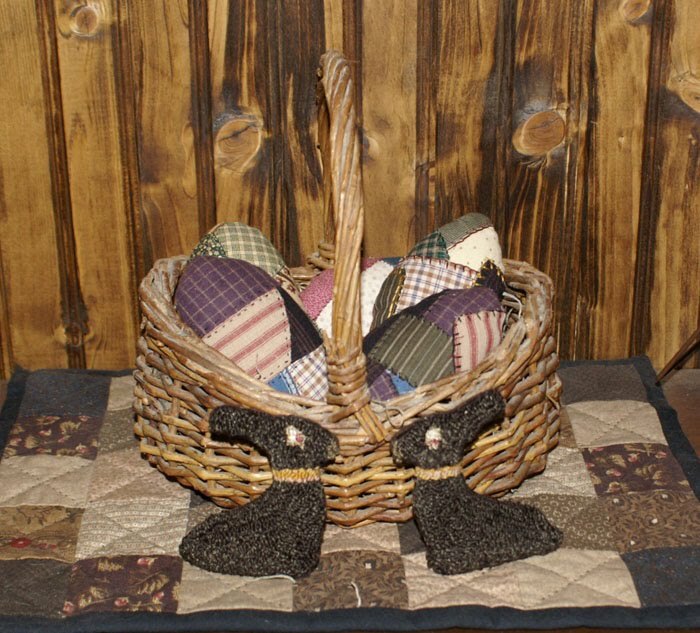 It has been a rough winter and still sore, but tired of my house, so cleaning a bit at a time and one way to make it fun, is to make new things to decorate with and as you can see, I am ready for spring and the first thing is Eggs to fill my baskets with. I got an idea and it is something anyone can do, quick and easy and a great way to use up scraps. I started by using card stock and drawing some egg shapes onto it. If you can't draw one, you can find them on the internet. I used weavers cloth, I have a ton of primitive white that is no good for punching, but perfect for this. 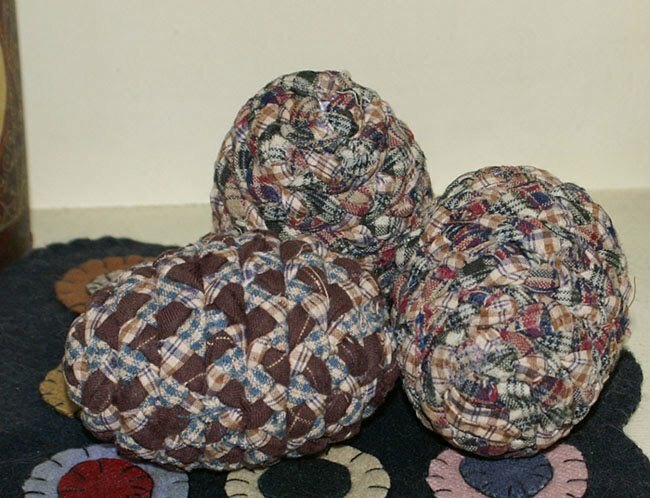 Double your cloth and lay the egg shape on top. I used an art pen to trace around the egg, you can use anything, it won't show. Then I marked the front and back, so that I used the right side which is important when you sew them together. My eggs are asymmetrical so I need to make sure that they fit when I sew the edges. Next is the fun part. Get out your scraps and cut them into any shape you like and lay them over the fabric egg. Pin the pieces down and turn it over. 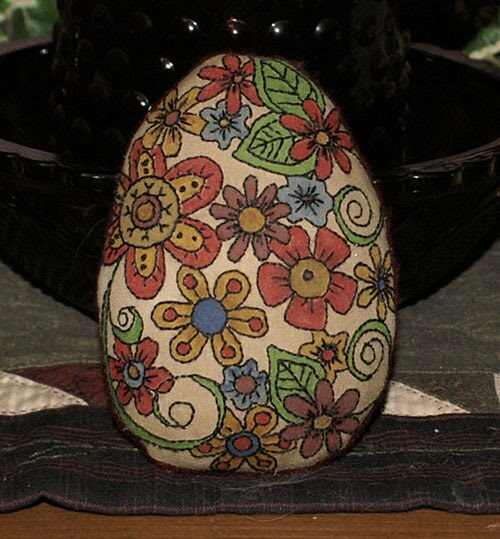 Cut off the excess fabric around the egg, that helps when sewing. Now you can sew down your pieces. You can do a blanket stitch, whipstitch or make it fancy like a crazy quilt. You can tuck the edges of your fabric or sew over the raw edges. Once you have your pieces sewn, you can trim your eggs by following the white fabric. I decided not to stain these eggs, they are darker in real life, but lighter in the picture. This is a dark area, so I like a little pop of color. The bunnies are ones I made last year, but I think some prim bunnies would look nice on the bench too. I am also adding a few more eggs to the pile. I love to experiment, some things work, some don't, but I learn about products and how I can change things to improve on them. I wanted to use fabric markers and still get a prim folk art look. I started with marvy markers, then I added some watercolor pencil and art pens. I think I got carried away and turned my colors to mud. What I need to do is, have more markers in coordinating colors, so I can shade without overdoing it. I like the marvy markers, they go on nicely, they don't bleed and can be washed. When I was done, I started by painting on distress ink, not a good idea. The watercolors started to bleed out. So, I tamped up some of the color and then tried a light spray and that worked without bleeding. I guess I should have heat set the colors first, then added the spray;) But it worked in the end, the cloth was pure white and the spray gave it a nice aged look and covered what little red that was showing. 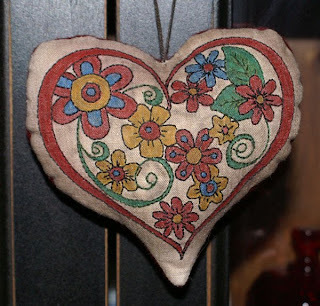 This would be fun to do with small hearts too and hang them on a prim, valentine tree. I distressed this piece with Distress It, on the cloth, before I made the pillow, I think it stained nicely. I also made some more little pillows from Tiffany's designs. I am in a rabbit and easter mood, so the bunny if going to go into a new project I will be trying out. The pillows are made with tea stained fabric from moda, a light and a dark shade. 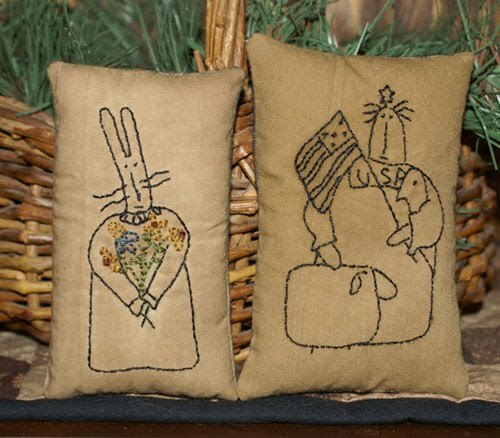 I used distress on them, after I made them into pillows, and they didn't stain, seems the stain goes into the stuffing. So, if you use distress it to antique a piece, it works best on flat fabrics. I had a lazy day today, I did some cleaning and some baking, and then some stitching, but nothing big. I am working on a stitchery heart and experimenting with fabric and ink markers, so that should be done tomorrow. I am cleaning my sewing room, so I can work more efficiently and find things. Over the year, I have been creating and throwing things around, now it is a total mess. With my ribs, I can only do so much at a time, but getting there. I am using plastic boxes and pull outs drawers, so I can store, but get easy access, without making more clutter. 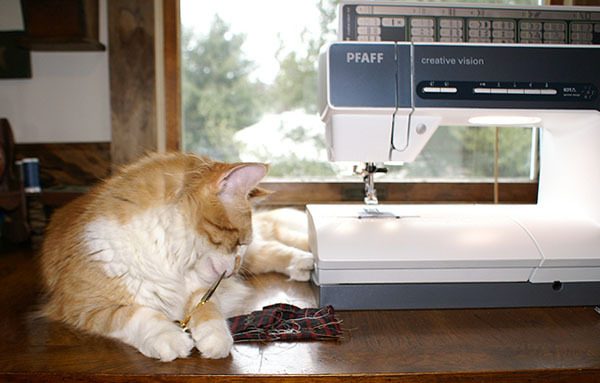 When I just had Dora, she was allowed in to help me sew, but now she is too obnoxious and the others would get jealous. This is what happens when Dora helps, she has a fixation with eating things. She has also chewed off all the tips, on one of my fake plants. She will chew on anything, including needles, so I have to keep everything in tight boxes. On the Accuquilt go front, I am still having problems. I had more free money, so I got the apple core die. It came and I noticed it was warped, so told the company I ordered from and they sent me a new one. The new one is warped, does to happen to others or is it just me? I got a replacement for the hexagon die and was cutting my new ones with the middle size and it bent? 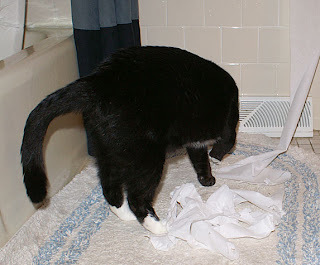 Well, as you can see, Moki wanted to help with the drawing, so he got the paper ready to write the numbers down. All that paper unrolling sure makes Moki thirsty, so he had to take a drink before we picked a number. And now for the winner, I know I am being mean, making you read and look at photos, lol. The lucky winner of the CNS, wall art and decor giveaway is.......... Lucky Number 2...Amy of Cottageprims. Congratulations to Amy and look for a freebie later this week. Please email me and I will send you, your gift code. Have fun shopping! 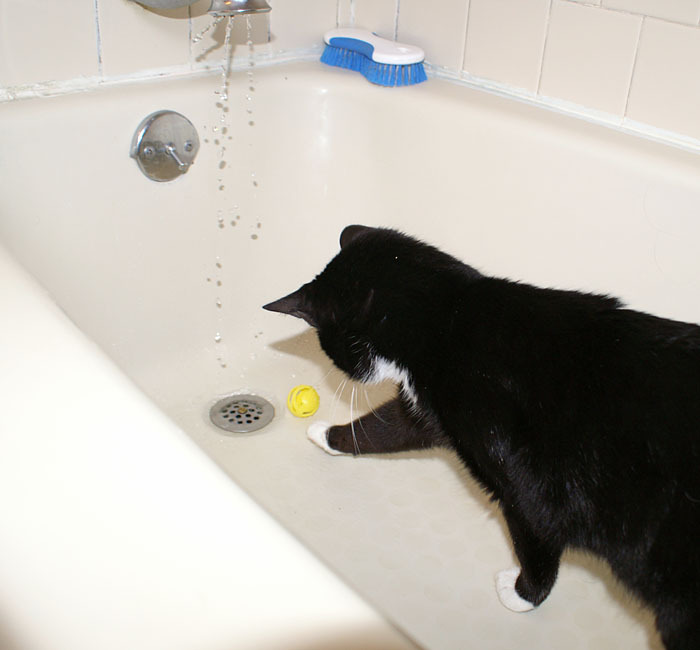 And now that it is over, Moki has gone back to do another of his favorite things, water polo! Tonight is the last night to enter into the contest. You don't want to miss out, who wouldn't like free money to spend on anything you want;) You can still sign up tonight, the drawing will be tomorrow. I started my christmas hexagons. 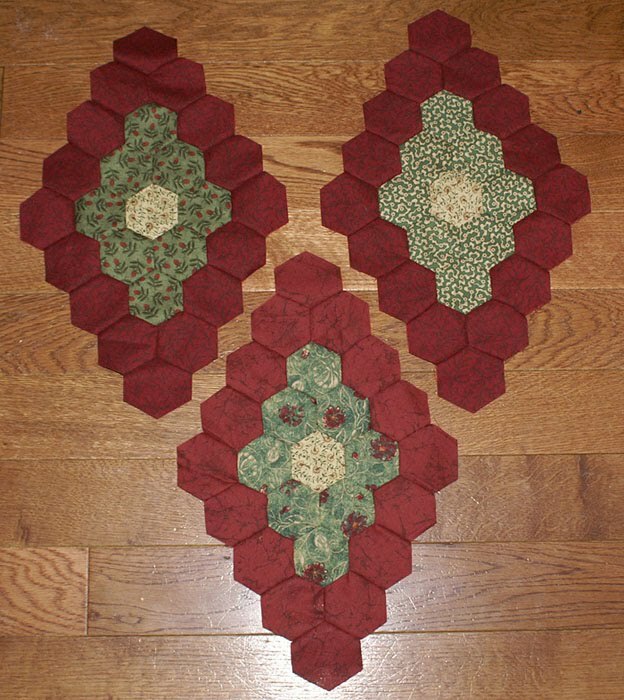 I was going to go with colonial florals, but found I have a lot of the darker red and black shades, so hoping I have enough of these three to do them all this way. 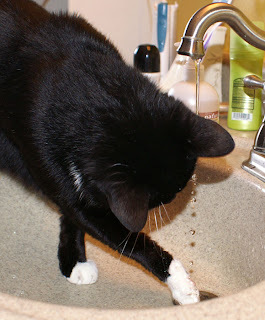 I will mix the greens up, using what I have. I want it to be uniform in some ways, but scrappy in other. I will be adding a border of a dark cream shade so that the diamonds will be sitting on a cream background. It all depends on what I can find to match, I may change my mind;) The sizes are all the same, it is the angle that makes them look off. I finished a little piece today. 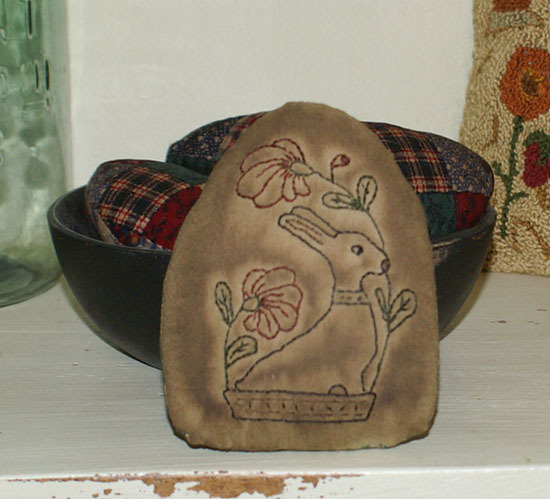 I wanted to do something with felting, so I made the bunnies with wool roving. I cut out the wool shapes and felted onto those first, then I clipped off the excess to get the pieces into shapes. I like how some roving sticks out, it looks like bunny fur. For the lettering, I used the wash n go. I learned one thing, do not use sharpies to write with, it bleeds when you rinse off the paper. I had to use soap and wash it to get the light letters back. I am thinking of adding small embroidered flowers into the background, something that isn't too bold, just blends in with the background. The design is from Primitive Blessings. And for the Moki fans! This is what I have to put up with, when I am working around the kitchen. Moki thinks it is fun to grab, bite and dig his claws in, he tends to get a bit rough. When I cook, he hops up and tries to help, and one day he even pulled a piece of squash out of the sink and ate it, he has a strange appetite. And don't forget to sign up for the giveaway below. It ends friday at midnight. The winner gets a gift code to buy anything they like.